Amorino delights connoisseurs around the world with its finest quality gelato, which is made according to traditional Italian methods. The taste of each gelato is not only dependent on the most rigorous selection of sourced ingredients but also on the patience and the attentiveness of highly trained chefs during its preparation. Amorino insists on using only organic and natural products, paying particular attention origins of each ingredient and also by monitoring production methods. 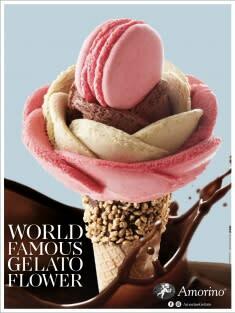 Enjoy Italian gelato at its finest. Macarons, chocolates, sweets, hot drinks and milkshakes also available.